BNM kept OPR at 3.25% at the first MPC meeting of 2019, as widely expected. Private sector to do the heavy lifting in sustaining growth in Malaysia amid consolidation in public spending and softening external sector. Moderating global growth, a less hawkish Fed and subdued domestic inflation provide room for an extended pause in monetary policy. We now expect BNM to leave monetary policy on hold and therefore adjust our end-2019 OPR forecast to 3.25%. As widely expected, Bank Negara Malaysia’s (BNM) Monetary Policy Committee (MPC) maintained the Overnight Policy Rate (OPR) at 3.25% for the sixth straight meeting. The decision was well anticipated by us and all analysts surveyed by Bloomberg. The MPC statement made a more cautious assessment on global economic outlook as trade tensions began to impact global trade performance and investment activity in late 2018. BNM highlighted country-specific factors as one of the key downside risks for global growth prospects. 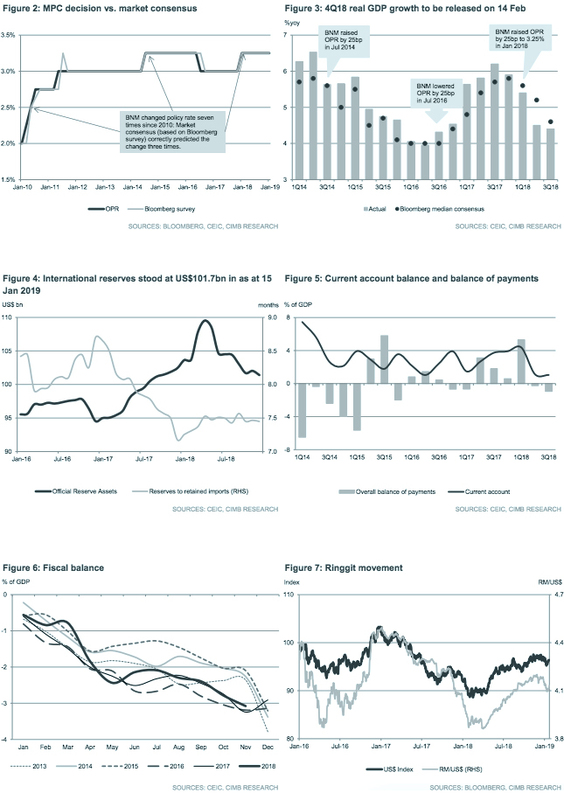 As a result, the central bank assessed that the external sector is likely to soften amid moderating global growth, a downgrade from its previous assessment which indicated that “exports are projected to provide an additional lift to growth, albeit to a lesser extent.” On the domestic front, BNM projected sustained expansion in private consumption and private investment to offset consolidation in public spending. While the Federal Reserve raised the US Fed Funds Rate (FFR) to 2.25-2.50% in December 2018 as widely expected, policymakers signalled a slower pace of interest rate normalisation, with the median dot plot projections pointing to two rate hikes in 2019 from three in September 2018. Signs of slowing economic activity cited in the Fed Beige Book, as well as the ongoing US government shutdown, have led to Fed policymakers urging patience on further monetary tightening. We now expect the Fed to take a less hawkish path to FFR hikes in 2019, with just two rate hikes vs. an earlier assumption of three. Against a backdrop of weaker oil prices since November, we lower our headline inflation forecast from 2.7% to 1.8% in 2019. 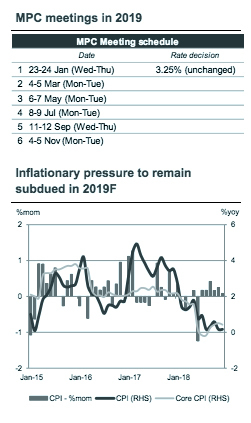 The materialisation of two risks to our monetary policy outlook, namely inflation undershooting the policy target as well as a less hawkish Federal Reserve, leads us to remove our call for one interest rate increase in 2H19. We now expect BNM to leave monetary policy on hold and therefore adjust our end-2019 OPR forecast to 3.25%. Originally published by CIMB Research and Economics on 24 January 2019.